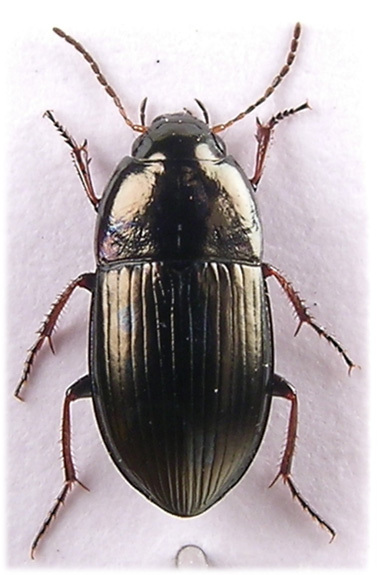 Male Found throughout England, Wales and Scotland including the Western Isles, generally widespread and common but records are more scattered across Scotland. A species of open, dry habitats, often seen running in bright sunshine, the vast majority of Amara specimens seen in gardens and the town centre will be aenea ¹. Around Watford there are many parkland pathways following the course of rivers e.g. Radlett road, Oxhey and Cassiobury parks, and here aenea will be found in company with A.plebeja Gyll. 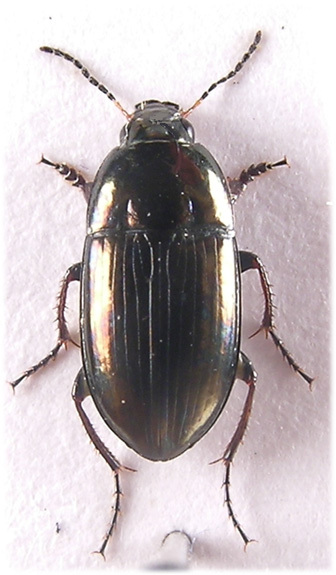 (and other carabids) both diurnally and nocturnally, in such situations A.plebeja is by far the more common species, moving	away from waterside habitats aenea becomes the more common and often the only Amara seen diurnally. We have recorded them from all months of the year and in many habitats; Common moor (the dry, eastern side), on bridal paths and across the farmland bordering Whippendell wood, Cassiobury park and town centre pathways. 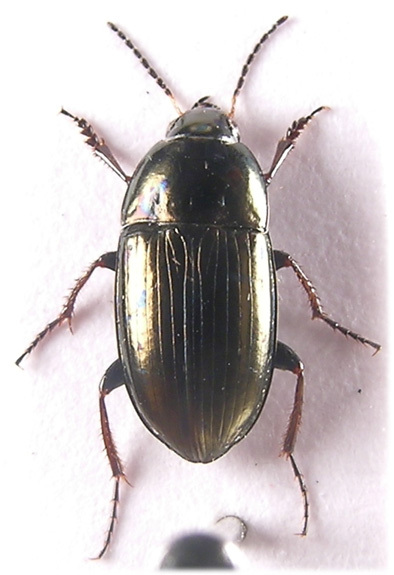 We have occasionally found them under bark, in grass tussock samples and in garden pitfalls during the winter. Perhaps most common during the spring when they breed. Although fully winged and active on warm summer nights we have never found them at MV even when the lights are run close to pitfalls that regularly produce the species. 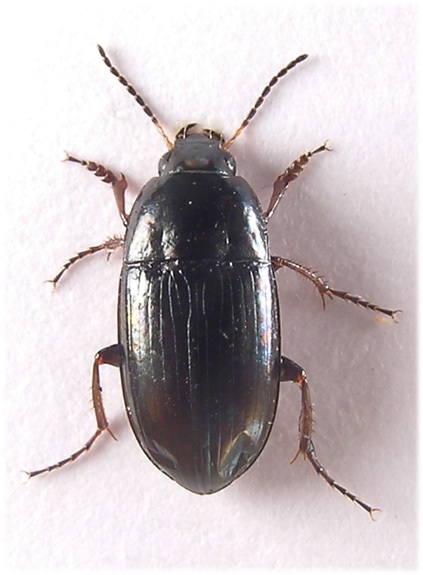 It may be worth noting, as we have elsewhere, that 2007 was an odd summer; following the wet and generally overcast May and June carabids were far less obvious than usual during the summer, compared with 2005/2006 the pathways in Cassiobury park were noticably lacking, so much so that our intended quantitive recording was abandoned, but around Queens road where aenea and Notiophilus biguttatus were seen in numbers on every hot day during 2005 and 2006 no specimens were seen during 2007. 6.2-8.8mm. Black with metallic green or brassy lustre. Antennae with first three segments and base of fourth yellow or orange, third sometimes darkened apically. Eyes gently convex, protruding only slightly, with two supra-orbital setiferous puntures on inside margin. Pronotum shining although microsculpture obvious towards base (X20), strongly bordered laterally and finely so basally, often not obvious at centre. Outer basal fovea present only as a weak depression or entirely absent, inner fovea reduced to a short, sharp longitudinal streak parallel with, or deviating only slightly from, the centreline of the beetle, usually with a few coarse punctures between this and the pronotal base. Front angles protruding, sides almost parallel in basal half. Basal seta close to hind angle which is almost a right angle, without a protruding tooth. Elytral microsculpture obvious (X20), scutellar striae at least as well impressed as adjacent ones (cf. A.tibialis) although they may be of unequal length and interrupted. Without pore puncture. Interstices flat but rarely they may be weakly convex apically (M.Telfer pers.comm.). Seventh striae with two preapical punctures, usually there is another at the tip of the second stria. Epipleurs crossed. Legs dark with tibiae paler, at least basal half of meso and metatibiae. Male with three dilated protarsal segments. 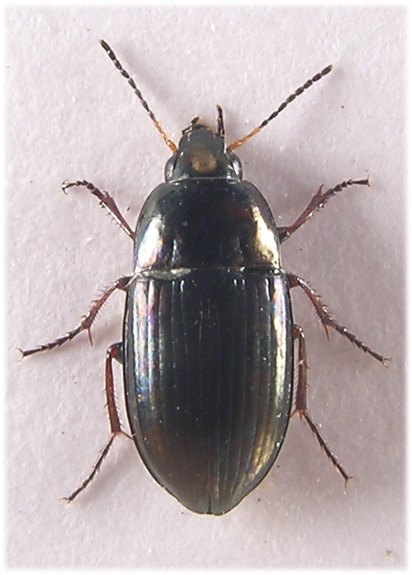 ¹ Another common local species, A.familiaris (Duft. ), found in the same habitats, tends to be less noticeable in its behaviour and in our experience is seldom seen.